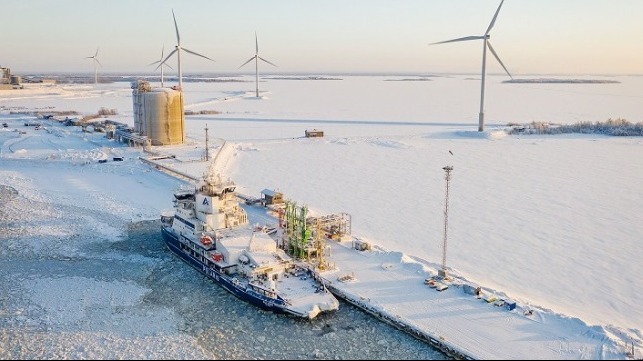 The world’s first icebreaker to use an LNG engine, IB Polaris, has bunkered LNG at the Tornio LNG terminal in Finland. Until now, the northernmost suitable terminal was located in Pori, which is too far from Polaris’ operating area in the far end of the Bothnian Bay. Some LNG has been delivered by truck, but Polaris has had to rely mainly on diesel. Polaris, joined the fleet of Finland’s icebreaker operator Arctia in September 2016. In addition to using LNG, all of Polaris’ operations aim at environmental friendliness. 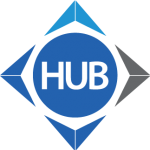 For example, the lubricant used in the ship’s propulsion system is biodegradable. The ship’s gray water, which basically consists of showering water, is collected to a container which is emptied during port calls. Polaris is also the first icebreaker to have an in-built oil recovery system. The system, using equipment from Lamor, was tested for the first time off the coast of Helsinki last year. The equipment tested in the exercise included, the skimmer located inside the ship’s hull and the collection booms. Efficient maneuvering and operation of the vessel in an oil recovery situation was also practiced. With its equipment, the Polaris is able to collect about 1,400m³ of oil at one go with a rate of 200 m³/h in harsh weather and ice conditions. The vessel is equipped with three Azipod propulsion units rotating 360 degrees which gives her excellent maneuvering qualities. 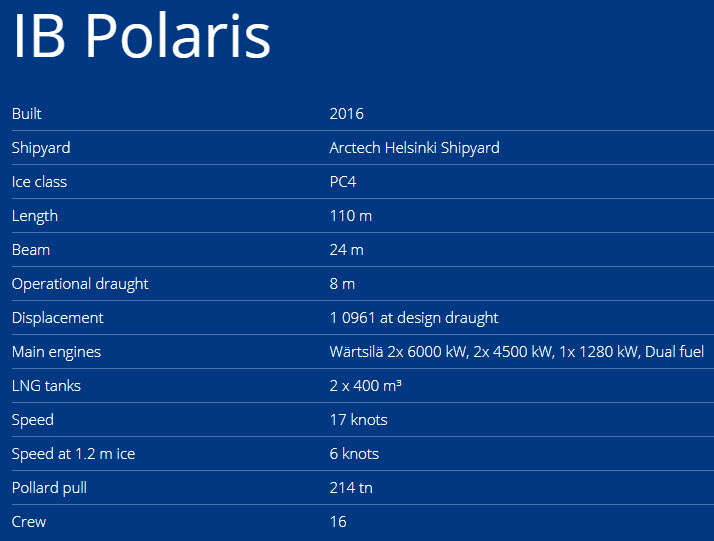 The icebreaking capacity of Polaris is 1.2 meters at a speed of six knots. In a real oil recovery situation, the speed of the vessels is usually low, close to two knots. 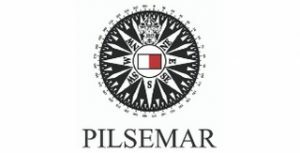 At low speed, Polaris’ advanced navigability is used during slow forward and sideways movement. Sideways operation works in rough water, when the entire side of the vessel can be used for directing the oil into the collection tank. 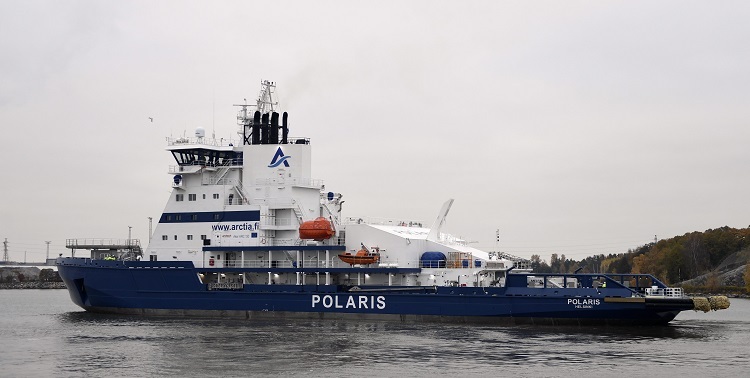 The first two icebreaking seasons of Polaris have proved that oil recovery preparedness and the use of LNG are compatible with each other, says Arctia. LNG as a means of propulsion supports slow speeds that are essential for successful oil recovery operations in the open sea. Arctia says it is now ready to offer oil recovery services in Arctic waters in addition to the Baltic Sea.